Now is the time for our Nation to take bold action. We strongly support President Trump’s plan to end the HIV epidemic in America,” said CDC Director Robert R. Redfield, M.D. “We must move beyond the status quo to end the HIV epidemic in America. 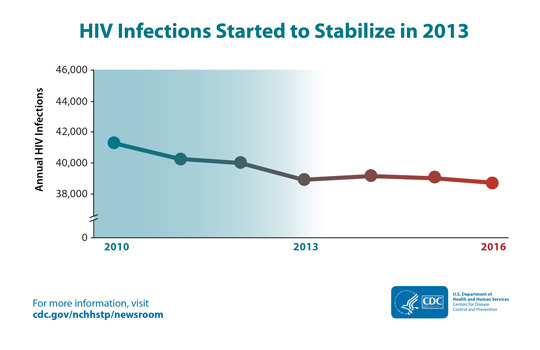 We have an historic opportunity to improve the precision of prevention,” said Jonathan Mermin, M.D., M.P.H., director, CDC’s National Center for HIV/AIDS, Viral Hepatitis, STD and TB Prevention. “This infusion of resources will finally relegate America’s HIV epidemic to the pages of history. After a decades-long struggle, the path to eliminate America’s HIV epidemic is clear,” says Eugene McCray, M.D., director of CDC’s Division of HIV/AIDS Prevention. “Expanding efforts across the country will close gaps, overcome threats, and turn around troublesome trends. View a related fact sheet, HIV Incidence: Estimated Annual Infections in the U.S., 2010-2016 [PDF, 246KB]. View related data summary tables [PDF, 38KB].